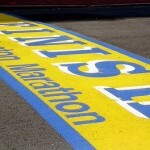 David chats with filmmaker and Boston resident Lorie Conway about Monday’s bomb blast at the finish line of the Boston Marathon. At the time of the explosion, Lorie was making the 5 block trek from her apartment to the finish line when she heard the explosions and began to see the commotion head her way. She chats about the mood in Boston and the possible effects this will have on Boston’s future.